Accurate, consistent, and homogenous data are critical for understanding the current climatology of tropical cyclones and identifying any trends in these storms in a changing climate. To evaluate the suitability of existing data for these tasks on the global scale, CICS-NC’s Carl Schreck III and co-authors Kenneth R. Knapp and James P. Kossin (both from NOAA’s National Centers for Environmental Information) compared two subsets of the International Best Track Archive for Climate Stewardship (IBTrACS) data set—one based on data from the various World Meteorological Organization agencies, the other from a combination of NOAA’s National Hurricane Center and the military’s Joint Typhoon Warning Center. While the two data sets agree substantially in many aspects, the authors identify some significant discrepancies. They also discuss some of the reanalysis efforts underway to improve these data sets. 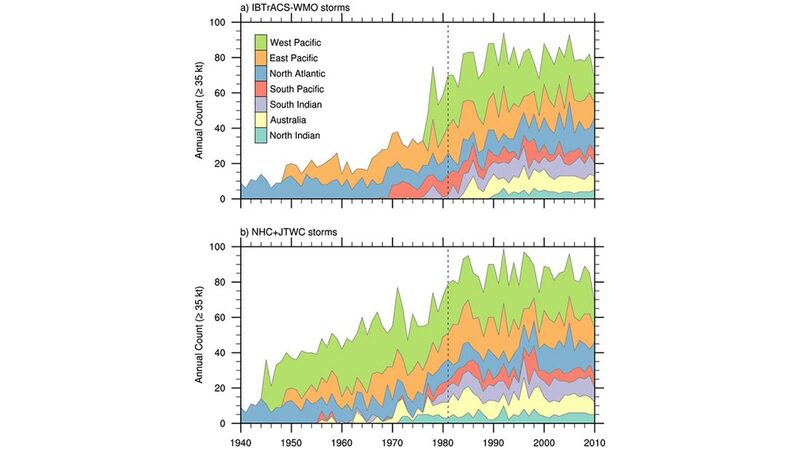 Some key results from the paper are available on the NCEI website at: https://www.ncdc.noaa.gov/ibtracs/index.php?name=climatology.